For this week's installment of our discussion series on this book, I'm sharing part of my story. I'm honored by your visit here, and Megan and I are deeply appreciate of your feedback on these posts! My independent spirit was inspiring, was it not? Just call me Erin Brockovich. It’s not that I was a complete pushover. I had plenty of strong opinions. It’s just that I often assumed that someone else knew better than I did. While I love to cook, I went for years without ever making adjustments to recipes, because I figured that the person who first concocted the dish had perfected the process. When planning my wedding, I often deferred to the ideas of our parents or attendants about what would make an enjoyable experience for the guests, because what do I really know about weddings, anyway? As I grew into a relationship with God in my teen years, I prayed for direction on matters big and small, and sometimes received a clear message that I could embrace with confidence. But you know those times when God doesn’t give a completely transparent answer right away? I am not a fan of that. It is said that God often speaks in whispers, but I’d prefer that His voice carry at the same decibel level as a cable news program. Lord, could you please scream at me in such a way that I cannot possibly doubt what You think? He doesn’t often oblige that super-mature request, though. And for many years of my life, I didn’t trust myself to discern His voice over the others in those situations…so I usually listened to the one that spoke loudest. Someone who would just give me the answer. 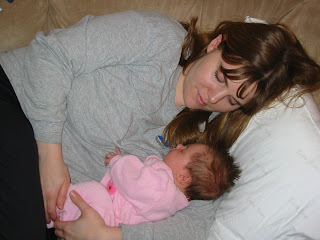 In many ways, the story of my entry into parenthood mirrors Megan’s. From the moment I stood in the bathroom gazing at two pink lines that would forever change my life, I was bound and determined to figure out the right way to be a mother. And thankfully, as anyone who’s ever announced a pregnancy has discovered, there is no shortage of advice to be found on the subject. Mark and I were inundated with information on the best way – even “God’s Way” – to raise an infant. Several people introduced me to the same book that Megan received and I, too, was completely enchanted with the promises contained within its pages. Taking careful mental notes, I breathed great relief, thankful for this voice that was loud and clear within my social circles and was offering me the answers to parental success. I now knew exactly what to do – and just as importantly, what not to do – to achieve a harmonious home, raise an obedient child, and order our lives in a way that pleased God. And then Maya was born. Eight pounds of sweetness, from her wide, soulful eyes to the thick, dark hair that would take months to relax from spikes and swoops into a smooth, manageable style. Little did I know, as I cradled her in the hospital that first night, that her personality would mirror that hair in many ways. And that my careful plans to follow the advice of the “experts” would come crashing down around me almost immediately. Right from the start, there were some struggles we hadn't counted on. Breastfeeding was profoundly more difficult than expected and required hours of assistance from lactation consultants and products that would aid in overcoming Maya's latch issues. Once she was eating more easily, she didn't want to stop, and I was feeding her every hour-and-a-half almost round-the-clock. I was exhausted; physically, mentally, emotionally. It was my husband’s support, my ever-expanding love for my daughter, and God’s faithfulness in sustaining my strength that got me through the early weeks. By the time Maya was three months old, we’d started to adjust. Those brown eyes crinkled up at the corners now as we were greeted with her first toothless grins, and we were infatuated. Breastfeeding, while still a struggle, was something that I no longer faced with trepidation. As much as things had improved, however, I wrestled with a deep-rooted sense of failure. And every comment from well-meaning friends - excellent parents whom I longed to emulate - would drive the shame deeper. "Oh, she's three months old...so she's probably eating every four hours now. That’s such a relief, isn’t it?" We weren’t on a feeding schedule. I'd mumble through an evasive response, then return home to resume our all-day-long nursing frenzy. No, she wasn't sleeping through the night. Not nearly. And…oh yes, the book. The one whose every word I’d hung on just months before. The one that offered such clear answers. Laura-the-biology-student would have jumped at the sight of step-by-step solutions. Laura-the-cook would have followed the recipe to the teaspoon. Laura-the-bride-to-be would have caved to the wisdom of those who knew better. Laura-the-mother couldn’t do it. Couldn’t cut it. I couldn’t stretch out feedings. when I felt in my heart that Maya really did seem to need to nurse that often. I couldn’t leave her to cry, even when nearly every voice around me said that I must. Mark was ever-supportive, assuring me that I wasn’t doing anything wrong. Still, though, apologies flooded constantly from my lips - to him, to my baby girl, to God- to everyone impacted by my failure. I was going rogue, and had no idea where to turn for direction. And that’s when a pivotal change occurred in my heart. The moment I stubbornly decided that I was choosing to fail my own expectations and the ones of those around me, the voices started to disappear. I couldn’t hear anything anymore, and it was terrifying. But then…then and only then, I began to hear God’s whispers. He spoke, and confirmed the instincts He had placed in my heart from the moment He placed my daughter in my arms. He gently leads those who have young (Isaiah 40:11). He leads some mothers one way and some another because He knows and intimately understands His children. My mind spun in glorious circles as I resurfaced from the drowning and breathed deep this life-giving message. Every baby is His unique creation, every mother is His treasured child, every family has a calling, and when my heart led me to care for my daughter the way I was, it wasn’t rebellion or failure or the beginning of ruin, it was Him. The girl who didn’t want to take a step without clear direction from someone who knew better was finally learning to sort out the One voice that spoke steady guidance toward His plan for our family. Even when it meant a blind leap from the well-worn dust of the beaten path to an off-the-map trail of unknown twists and turns. It was not an easy route to choose, but it felt like home, and I was free. Even in those weary nights, as I fed and rocked my baby through the fatigue and frustration, there was freedom. It was sweet, and it was good, and it was God. To this day, I wrestle with the need for approval and often long for the security of expert advice. Sometimes the search for answers serves me well, as mentors and friends have spoken volumes of life-changing wisdom into our lives. What God taught me in my first year of motherhood, though, was a powerfully transforming lesson in tuning the frequency of my heart to pick up the whispers of the Spirit. Our home is harmonious when His melody leads. I love this description of your journey to freedom as a parent! I still struggle with other's expectations of my babies. I started cringing when people came up to me after church... They always asked the same question: is he sleeping well for you? Is he a good baby? My oldest didn't STTN till he was over a year and I still regret the way we went about that process. Because it wasn't our hearts, it was the expectation of others that led us. I look forward to reading your book! Blessings! In which I have severe Pinterest-phobia. I'm told that he fell with style. The Amish are psyching me out. Would somebody please pinch me?